1900 - Opium, morphine and cocaine in many patent medicines leads to addiction and death. 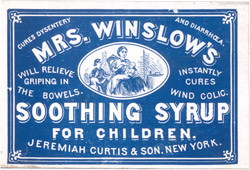 Mrs. Winslow’s Soothing Syrup kills many children each year due to overdosing on morphine. Morphine is the syrup’s primary ingredient but it is not listed on the label. During the past 120 years there has been a revolution in therapeutics. Medicines have been discovered to cure disease and to relieve pain. With these new medicines there is an increase in the misuse and abuse of some of them. This unit will look at some of these medicines and the abuses and the laws that have developed to help control the misuse of those medicines. It is important to keep in mind that prescription medicines can be just as dangerous when misused as street drugs. 1898 - Heroin is introduced. First thought to be non-addicting, but founded to be so addicting that health professionals, legislatures and the public call for its ban or control. 1899 - Aspirin introduced into medical practice due to its effectiveness, Bayer Company of Germany originally promotes it to doctors. This is the first safe and effective medicine that is not addictive. 1900 - Opium, morphine, heroin and cocaine in wide use in over-the-counter medicines made by a pharmacist or a manufacturer (known as patent medicines). 1903 - Barbiturates introduced as hypnotic (sedative), soon replace the more toxic bromides that are commonly used for headaches and stress. Bromides are in popular products like Bromoseltzer. People who become addicted to bromides might consume 3 to 5 glasses a day or more. Bromides are discontinued in products soon after World War II. 1912 - Hague Opium Convention Treaty in China. The United States signs international agreement to limit the spread and use of narcotics. 1914 - Harrison Act uses IRS taxes on the sale and purchasing of narcotics as a way to control use. The Treasury Department assigns the first narcotic agents to enforce the Harrison Act. 1919 - United States v. Doremus court case confirms that the federal government can regulate dispensing of medicines by physicians. 1919 - Webb et al v. United States court case confirms that physicians and pharmacists cannot supply an addict just to maintain his or her addiction. 1920s - Enforcement of the Harrison Act and the resulting restricted access to narcotics starts the smuggling of drugs from abroad. In this image, agents pour out liquid used to cover sealed packages of narcotics. 1928 - The Prohibition of alcohol. Doctors can write special prescription for pints of whiskey or wine for their patients. Millions of prescriptions are written and dispensed. Much of this alcohol is not used for medical purposes, resulting in the greatest diversion of prescription medicines prior to the present time. 1933 - Repeal of Prohibition. Organized crime groups who are put out of the liquor business turn to smuggling and selling narcotics. 1930 - Federal Bureau of Narcotics was formed. Harry J. Anslinger leads the bureau until 1962. Anslinger supports drug addiction research. A Public Health Service Hospital is built in Lexington, Kentucky. It is the United States government’s center for narcotic research and addiction treatment. 1930s - Law enforcement leads to diminished abuse of cocaine, opiates and marijuana. 1933 - Introduction of amphetamines into the United States. The military on both sides of WW II uses amphetamines. It is given on both sides to assist soldiers in staying awake during days of combat. Amphetamine use by civilians does not increase until after the war. 1937 - Marijuana Tax Act. Marijuana comes under federal control. 1938 - Amendments to the Pure Food and Drug Act brings the abuse of non-narcotic medicines under the responsibility of the FDA. 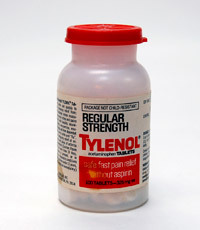 1955 – Tylenol introduces Acetaminophen. Finds wide spread use and becomes this country’s main over-the-counter pain reliever. It is safer than aspirin when given to children. After WW II there was an amazing development of new medicines: tranquilizers, new amphetamines and barbiturates, new opioids (synthesized opium products). Weight loss products are sold containing amphetamines and ephedrine. National marketing of these medicines increase their use. This post-war era brings with it affluence, social change and mass use of medicines and drugs. Many of the stimulant, tranquilizer and sedative medicines are misused. Amphetamines and barbiturates are call “mother’s little helpers” as many women develop a habit for the stimulation and sedative effects of these medicines. The predecessors to the modern Drug Enforcement Administration and other government and private organizations begin setting up education programs to stem the tide of abuse and addiction. 1951 – Durham Humphrey Bill sets up prescription and non-prescription categories for all medicines. This arrangement of prescription vs. OTC is in place by policy and is then made law. It also sets up limits on the number of times a prescription can be refilled. 1956 – Narcotics Control Act updates restriction and penalties for smuggling and distribution of marijuana and narcotics. Eliminates the suspension of sentences or probation if convicted. The Harrison Narcotics Act set up a schedule using letters to indicate the degree of potential abuse a medicine has. The schedule uses A, B and X in a decreasing level of potential abuse. This product dates from the 1950s. 1960s – The Manufacturing Act. 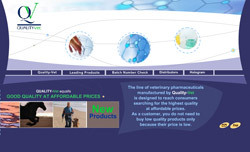 Its purpose is to tighten controls and restrictions over legally manufactured narcotic medicines. This law requires that manufacturers are licensed and creates quotas for classes of both natural and synthetic medicines. Bureau of Drug Abuse Control is formed in the Food and Drug Administration to control non-narcotic medicines that are being abused. FDA undercover agents, dressed as truck drivers investigate abuse of amphetamines by truck drivers. In 1968, that bureau merges with the Federal Bureau of Narcotics to form the Bureau of Narcotics and Dangerous Drugs in the Department of Justice. Advertisements in popular magazines assure the patient that potent medicines are safe to use. 1962 – White House Conference on Narcotic and Drug Abuse was a response to increase narcotic medicine and drug abuse. The conference eventually leads to the Comprehensive Drug Abuse Prevention and Control Act of 1970. 1963 – President’s Advisory Commission on Narcotic and Drug Abuse produces the 1965 Federal Drug Abuse Control Amendments. The new rules require registration of manufactures, wholesalers, and other establishments. These entities, plus pharmacists and physicians are required to increase record keeping of controlled substances. Marijuana is placed on the same level as narcotics. 1970 – Comprehensive Drug Abuse Prevention and Control Act is a United States federal law that, with subsequent modifications, requires the pharmaceutical industry to maintain physical security and strict record keeping for certain types of medicines. Controlled substances are divided into five schedules (or classes) on the basis of their potential for abuse, accepted medical use, and accepted safety under medical supervision. The medicine bottles have a C with the schedule number on the side and can be seen on the medicine containers exhibited above. 1973 – The Drug Enforcement Administration is formed in the Department of Justice from other existing enforcement units in the U.S. Government. Many agents from these other agencies move to the DEA. 1970s – The Office of Compliance, started in 1971, is renamed the DEA Office of Diversion Control. 2000 – The rise of the Internet to fill prescriptions or receive controlled substances is a growing problem. Illegitimate rogue web sites are filling orders for controlled substances without a prescription. The DEA sets up special units to monitor and shut down such illegal “pharmacies,” like this one for steroids. The problem of diversion continues to grow. Teenagers begin to experiment with medicines which results in addiction and deaths. New laws and enforcement efforts are put in place. However, the diversion of medicines grows to where it is now, among the most abused controlled substances. It is the responsibility of the doctor, the pharmacist and the patient that prescription medicines are used properly. 1988 – Anti-drug Abuse Act. In order to better coordinate the United States Government’s efforts to control drug abuse and medicine diversion, a position is created in the White House – the Director of National Drug Control Policy. This individual’s popular title is the “Drug Czar”. In 2007 the Drug Czar is John Walters. 1992 – The DEA form 222 is required when a pharmacist orders Schedule II medicines. This paperwork closely monitors the movement and sale of this potently diverted medicine. This type of three-part order form has been required since 1914. 2005 – The Combat Methamphetamine Epidemic Act of 2005 - In order to cut off the supply of precursor chemicals to make methamphetamine, this act nationalizes restrictions on retail sales of ephedrine and pseudoephedrine by requiring these products to be kept behind the pharmacy counter or in a locked case. It requires purchasers to buy no more than 3.6 grams a day and 9 grams a month, show I.D. and sign a sales log. The act increases the monitoring of imported precursor chemicals and imposes quotas on manufacturers for production and importing of ephedrine and pseudoephedrine. 2006 – Diversion and misuse of steroids, growth hormones and stimulants by athletes becomes a national scandal. The same problem has arisen in other parts of the world and at the Olympic Games. The misuse of these medicines casts a shadow on all sporting events. 2007 – It is the responsibility of the pharmacist to be confident that the prescription presented to her/him is authentic and that the medicine being prescribed is used in acceptable medical ways. Non-medical use of medicines is now greater than the abuse of cocaine, hallucinogens and inhalants. Among adults 26 or older, 6.3 percent reported non-medical use of prescription medicines in 2005. In children 12 or older, 2.2 million reported non-medical use of prescription medicines, mainly pain relievers and tranquilizing medicines.